Magica® Rust Remover Liquid removes rust from just about any surface including fabric, carpet, upholstery, fiberglass and much more. We recommend the gallon liquid for refilling the 8 oz. spray bottle. No rubbing or scrubbing is needed. Rinse with water when you’re done. 1 gallon bulk container. Magica is a great rust remover for boat owners too. It removes rust stains from fiberglass, steel rigging, deck fittings, sails, canvas tops, gel coat, vinyl upholstery, marine carpets and boat cushions. Safe to use on almost anywhere, except for on glass or highly glazed tile because it will dull or etch these surfaces. Always test material for suitability and color fastness by applying Magica in an inconspicuous area. Thank you so much. Your product (Magica) worked wonderful on a hand knit sweater that had rust stains from pins used while blocking. I just wanted to call to let you know that I ordered Magica over the phone and it arrived very promptly. It's just like a miracle. My daughter-in-law tried every product and every home remedy available to get the rust stains out of my granddaughter's karate uniform and nothing worked. The Magica removed all the stains! Thank you. Q. What types of fabrics can I use Magica Rust Remover Gel on? A. Magica can be used on cotton, wool, linen, polyester, silk, and even carpets. Always test material for color fastness in the least conspicuous area first. Q. I recently moved our filing cabinet and found a rust stain on my rug. Will Magica remove the stain? A. Yes, simply apply a small amount directly on the spot. Wait just a couple of minutes (until dry) and then vacuum thoroughly. Q. A leaky faucet has left a stain in my sink. Will Magica remove the stain? A. Yes, that's a perfect application for Magica. Q. Is it safe to use large quantities of Magica and allow it to drain into our home septic system? A. We have not tested the results, but because Magica is acidic, we'd suggest not allowing much to drain into your septic system. Q. Can I just add Magica to our clothes washing machine to remove the rust from our clothing? A. No, Magica is for spot treatments only. Q. I have rust rings in my toilet bowl and tub, will Magica remove the rings? A. Yes, that's another good application for Magica. Q. Are there any surfaces that I should avoid? A. Yes, Magica will etch glass and may etch high gloss tiles. Q. 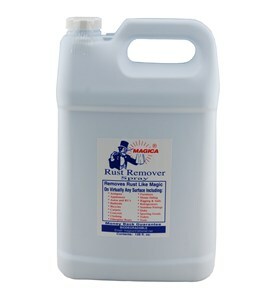 Do you recommend Magica Rust Remover for laundry? A. Yes, it works on laundry. We do recommend it for spot treatments on laundry.